Draco and Hermione had decided to leave the muggle world a while and move into the Malfoy Manor. Draco were afraid that no one would be able to help him if they were attacked and took Hermione from him. Lucius was very good at dark magic so he could protect Draco quite easily and Narcissa was great at hexes, so she could help Hermione, if Hermione even needed the help, the Brain of the golden trio remember? They stayed in the manor for a couple of days, but eventually, Hermione only got tired of staying inside. One day she decided to do something.
" Draco we can&apos;t stay inside for the rest of our lifes " " Of course we can!" Draco said and sounded very serious.
" You&apos;re joking right?" Hermione said nervously. " Of course. But what do you want to do? Should I ask Blaise to take Ginny with him so we can...?" " No! I mean, we can have some lonely time. Just you and me... If you feel like it" Draco looked very unsure. Since the attacks he didn&apos;t want to be all alone with Hermione in public, not that he minded for having her with him. But he feared every second that a death eater would jump in from nowhere and take Hermione from him. But this time he gave it a chance.
" Okay, lonely time. Just you and me"
They packed a basket with full of food and something to drink and a blanket to sit on. Hermione knew a place she used to go to when she was a kid and felt lonely. She decided they would sit in a meadow that was full of grass and an old oak. It was a wonderful summerday and there wasn&apos;t one single cloud on the sky. " This place is great" Draco said and sat down on the blanket. Hermione smiled in respond. They ate, talked, laughed and looked up at the sky. " I wish everyday could be like this " Hermione sighed and laied down on her stomach. 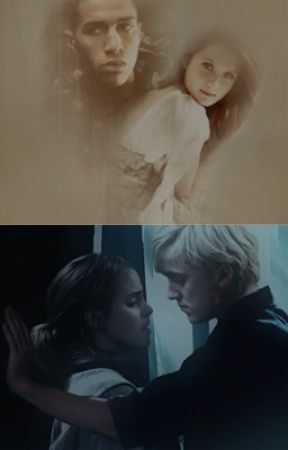 She leaned on her elbows when she felt Draco&apos;s head on her back. " My life feels so complete with you" Hermione said and smiled.
" Just you and me, Mione"